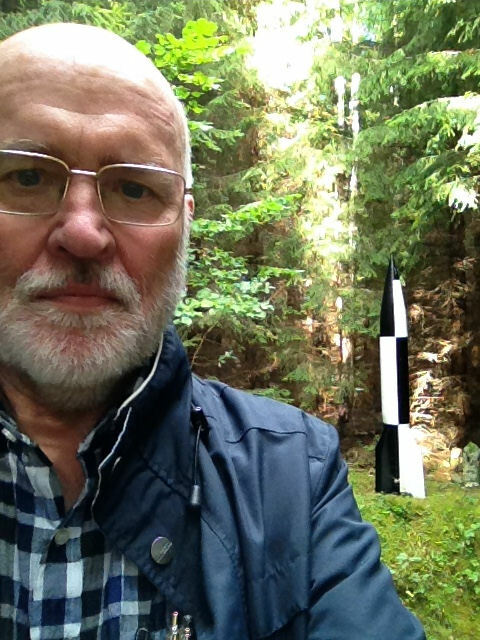 Finding the impact point of the "Bäckebo torpedo"
The story about the V-2 rocket that went astray and impacted in Sweden on the 13 June 1944 is well-known and recounted in many sources. I will just summarize the basic facts, describe a recent (September 2015) visit to the impact point, and add a few amusing anecdotes of my own that relate to this event. 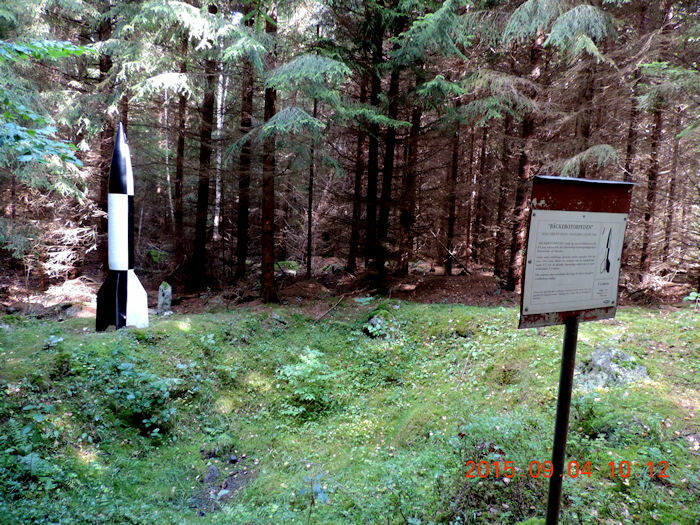 The rocket, V-2 test vehicle number 4089, was launched from Peenemünde. It is said to have been a test related to the Wasserfall project, a guided anti-aircraft missile. The V-2 test was intended to explore the possibilities of stering the missile with a "joystick" from visual cues. Therefore this particular V-2 was equipped with a radio control link. Somehow, the joystick operator lost control of the vehicle. The rocket hit the ground in Sweden at 1515 local time. The missile somehow exploded at a height of 1500 meters. Debris from the missile was collected and were brought to Air Regiment in Kalmar and from there to the Defence Aeronautical Experimental Institute near Bromma airport in Stockholm. Eventually the debris was sent to the Royal Aircraft Establishment at Farnborough. Sweden sent a protest note to Germany concerning the stray missile on 23 June 1944 and Germany apologized on 8 July 1944. The impact point is located in the village of Bäckebo about 30 km north-west of the major city of Kalmar on Sweden's county of Småland. The nearest farmhouse is called Gräsdal. The turn-off from road 125 to the south at Knivingaryd is easy enough to find, but then another left turn is needed after just another 100 meters. 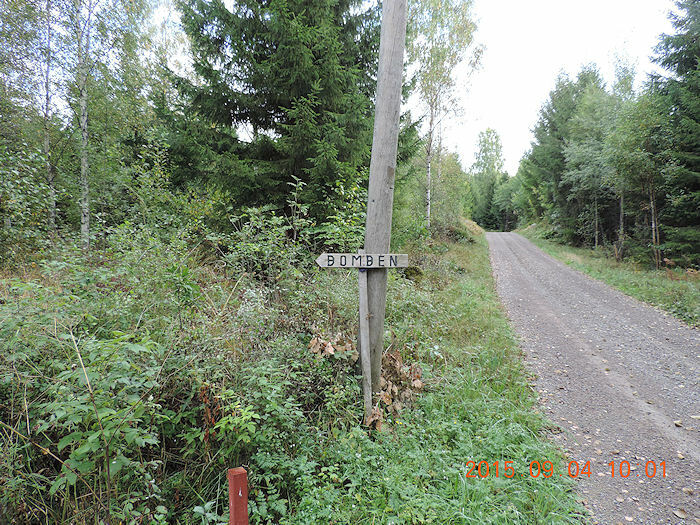 This road is quite a narrow dirt road and the Gräsdal farmhouse is hidden behind rather dense trees, so it is easy to miss. 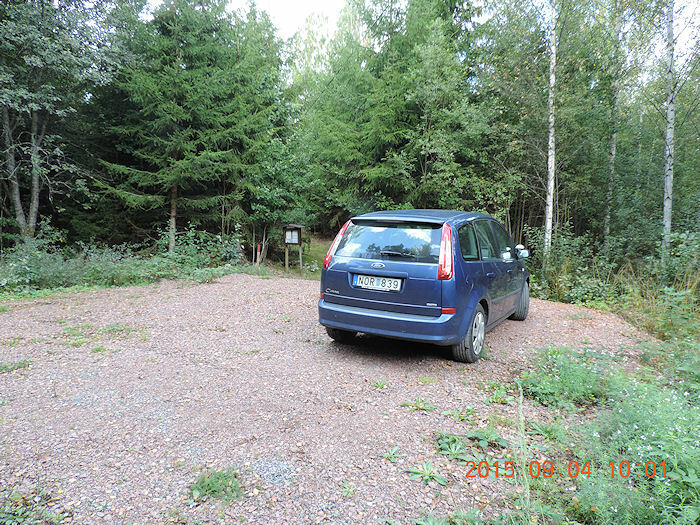 And then you almost lose hope of spotting the sign showing where along the dirt road in the forest the 300-meter long footpath to the impact crater begins. This is what it looks like. The sign says "BOMBEN" ("The Bomb")! Next to this sign is actually a little parking lot and just there is a little signboard explaining all about the rocket, which is called the "Bäckebo torpedo" in Sweden because in those days missiles were called "aerial torpedoes". You can see my car parked in front of the signboard. The wooden post with a red tip is the marker for the start of the foot-path. (The time shown in the pictures with red datemarks is UT+1). According to signboard 2010 kg of debris were recovered from at and around the impact site, but that about 1200 kg more should have been found. 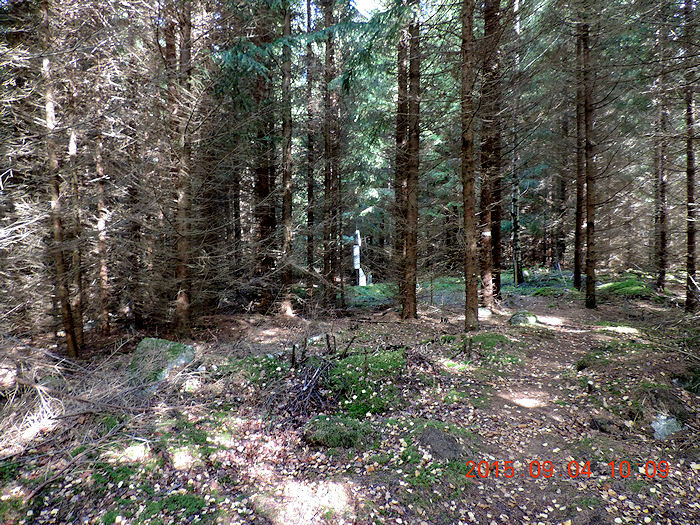 Here follow a few pictures from the path through the forest. 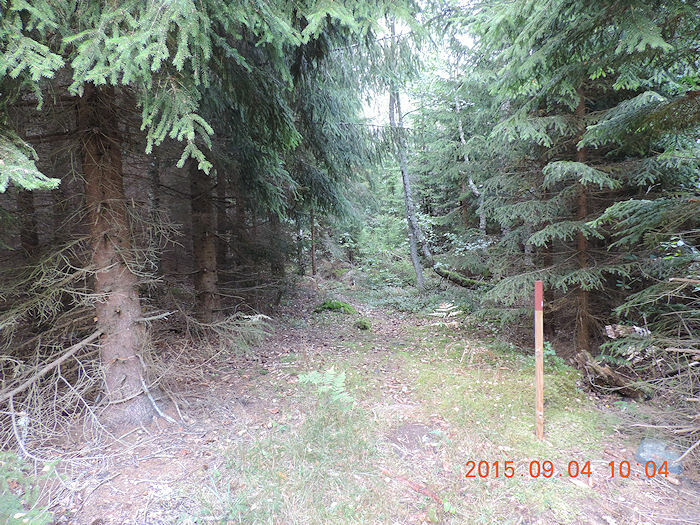 At least the path-markers are in good shape. The path is not very well-trodden. Hey, what is that? A rocket? Ah, here is the impact crater and the V-2 scale model (made out of fiberglass?) and another signboard. The signbaord says: "The Bäckebo torpedo impacted at this point on 13 June 1944". 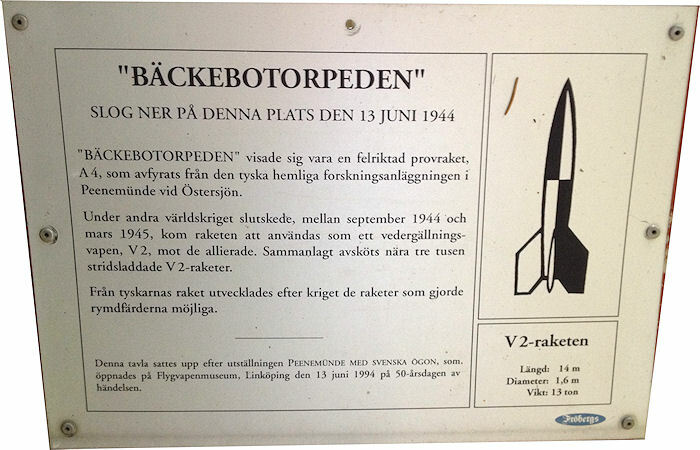 It ends with the fact that the signboard was put up following the exhibition at the Swedish Air Force Museum in Linköping on 13 June 1944 commemorating the 50-th anniversary of the event. Of course I could not resist taking a "selfie" at the impact crater. My Iphone put the impact point at 56° 54' 36" North 15° 58' 49" East. 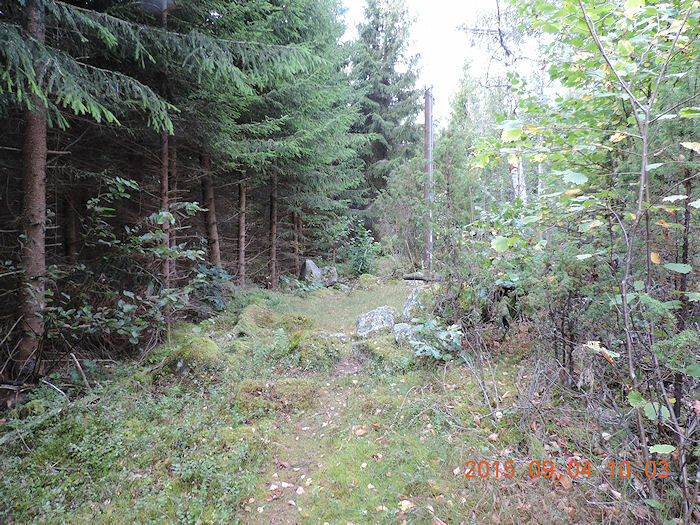 The Swedish National Heritage Board gives the coordinates 56° 54' 37.59" North 15° 58' 47.83" East. So, my Iphone is not far off the official number. 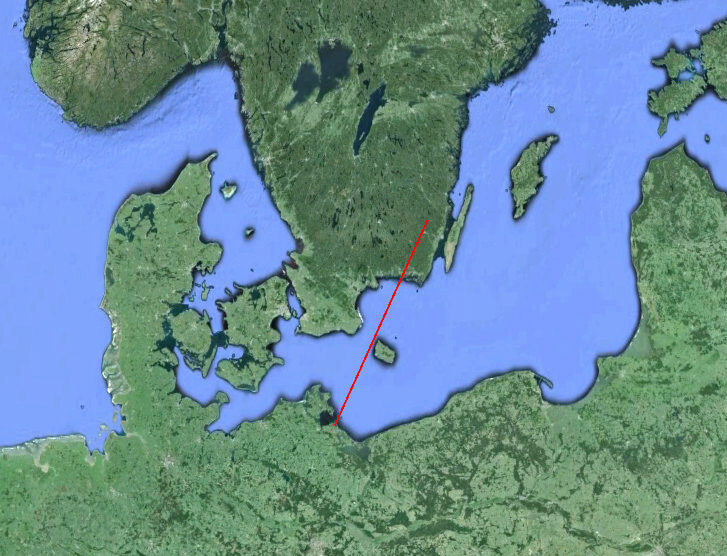 Using these coordinates and the known location of the launch pad at Peenemünde we can plot the ground track of the V-2 and calculate the flight range, which comes out at about 338 km, seemingly beyond the maximum range of the missile. This indicates that this was a non-standard missile with a light payload. In the late 70's I was employed by the Swedish Space Corporation and was working on studies of Nordic TV broadcasting satellite project (that later resulted in the Tele-X satellite, 1989-27A, catalog number 19919). My immediate superior in this was was Lars Evert Anderson and we travelled a lot to talk to various satellite contractors about the state of telecommunications satellite technology. I think it was in early November 1978 that we visited Los Angeles to meet with TRW (Thompson-Ramo-Wooldridge, absorbed by Northrop Grumman in 2002) to discuss broadcasting satellites. They invited us for lunch, and as always happens when space professionals meet they tell "war stories". My boss, Lars Anderson, described how he, the day after his eleventh birthday, was sitting in a relative's garden in Läckeby drinking fruit juice and eating a cinnamon bun when he heard a loud bang that shook the ground. The day after he learned that a "bomb" had dropped in nearby Bäckebo (about 20 km away) and that "nobody got hurt, but a farmer fell off his horse". One person around the table, chief engineer Adolf "Dolph" Thiel (1915-2001) interjected that "I was in the control bunker in Peenemünde when we launched that rocket". He went on to explain that the person steering the missile with a joystick had become so excited that he moved the control stick "out of phase". The launch crew knew immediately that it was going astray, probably to Sweden, said Thiel. On 14 March 1984, on a trip to Washington DC with SSC's president Fredrik Engström, we happened to bump into Thiel and we had lunch with him in Georgetown. He then told us that he was recruited to Peenemünde in January 1940, but that he would rather have become a fighter pilot, but since he was associate professor of engineering at the Technical University in Darmstadt he went to serve on von Brauns' team. At TRW he was program manager for the Thor and Able programs and later vice president for space at TRW. At the time of this lunch he was 69 years old and a consultant to TRW. By the way, after reading this article Fredrik Engström told me he also played golf with "Dolph" Thiel in California, but has forgotten on which golf course! The ”Report on a technical study of the Bäckebo aerial torpedo” was dated 21 July 1944 and signed by Henry Kjellson, in the Royal Air Materiél Administration. The report contained several appendices including professor Gustaf Boestad's preliminary, but surprisingly accurate, assessment of the rocket's propulsion system . At the time of the Bäckebo torpedo Boestad was professor of machine building at the Royal Institute of Technology in Stockholm. Gustaf Boestad (1899-1984) had several daughters, one of which is Elsa-Karin Boestad-Nilsson (b. 1925), who married Per Olov Valentin Nilsson (1929-2013). Elsa-Karin was an early computer programmer and worked at the Swedish Defence Research Institute to compute rocket trajectories and write code related to nuclear weapons. Elsa-Karin and her husband had four children, a son and three girls, one named Eva. Eva subsequently adopted her maternal grandfather's family name and this is how I came to know her when I hired her in 1983 to work at the Swedish Space Corporation in Solna, Sweden. She was assigned to work on the man-machine interface for the control center for the Tele-X geostationary TV satellite. She had graduated with a M.Sc. in engineering from the Royal Institue of Technology in Stockholm and done intern work at Electricité de France and met a young man there. So, after a year or two she moved to Paris and married Mr Dupont. But I have heard in recent years from her mother that Eva and her children have adopted the old family name Boestad. So Eva's family name has described the trajectory Nilsson-Boestad-Dupont-Boestad!